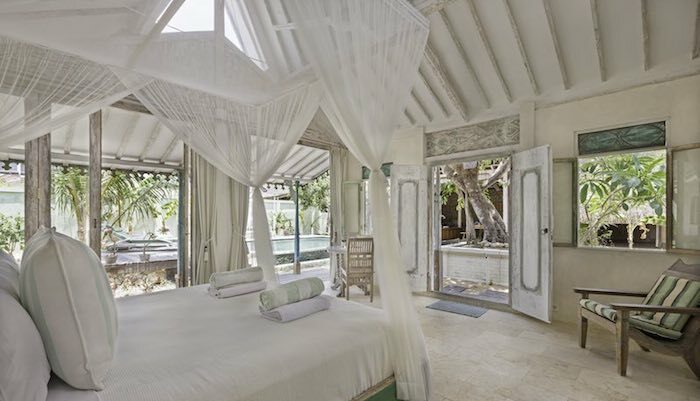 Samudera is a beautiful, balinese and javanese style, two bedroom beach home (villa) situated within a lush tropical garden under a large mango tree and lovely pool, perfect for cooling off and relaxing any time of day and night. There is also a rustic sleepout nestled in the garden, beside the pool, with a queen size bed. Samudera accommodates up to four adults (plus children). 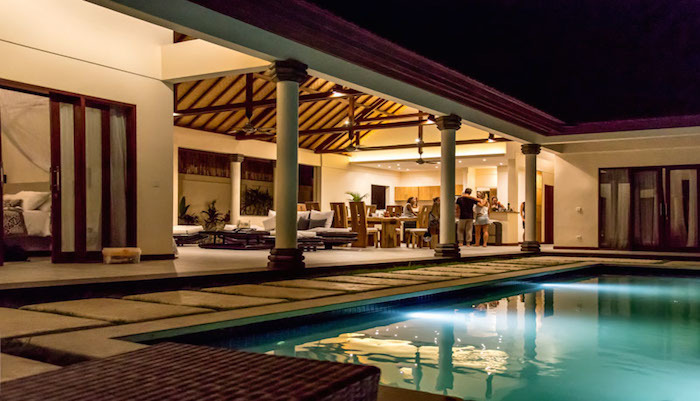 Villa Samudera is perfect for a romantic getaway for a couple looking for spaciousness and seclusion; two couples hanging out together; a group of mates hanging out, or for the family surfing holiday. Villa Samudera is an open plan design, blending Balinese, Javanese and contemporary elements. It is situated 200 metres from the beach down a sandy gang (lane) from Shipwrecks Surfbreak and Jungut Batu Beach. Nusa Lembongan is a tropical island paradise offering a place that is naturally rich in its environment, especially its surrounding tropical waters, and traditional Balinese heritage and culture. Villa Samudera brings the outdoors inside, built with recycled Ulin (Ironwood) timber posts, beams and floorboards from Kalimantan, decorated with Antique teak javanese doors and wood panels. With the alang alang (thatched) grass roofing, high ceilings, and an open plan, the interior spaces stay cool making it a great place to retreat from the heat of the day. The only door to lock is the door to the garden entering the premises. The living, kitchen and dining areas are completely open and feature stunning interiors from the Indonesian archipelago and the Asia region. There are two beautiful main bedrooms that have large king size beds with natural linens and a private bathroom each, separated from the open plan living space with romantic curtains that create a private retreat, when it is needed. Each room has views to the garden and pool. The private rustic sleepout nestled in the garden beside the pool, provides a queen size bed and is a great place for a teen retreat or for hanging out by the pool. Villa Samudera is a perfect relaxing space, designed for sharing and yet is spacious enough to ensure privacy. We provide food basics including a self-serve Continental Breakfast of bread, milk, a selection of local tropical fruit, juice, spreads (honey, jam, peanut butter, and butter), Sumatran plunger coffee and selection of Lipton teas. A fully cooked breakfast by our wonderful staff can be provided upon request (one day before) at 100,000 rupiah per head, paid directly to our staff. Please note there is no Generator at the Villa and power outages are unpredictable on Nusa Lembongan.